YAY! 100 pages for a post by an idiot on a national act of supreme idiocy! ... Can we ship all the Brexiters off to the Isle of Wight and seal off all access now? Congrats, pikeypaul. This is genuinely one of my most favourite PS threads ever. It can only get more entertaining as we approach “exit”day. What upsets me is that everytime the Tories have a "night of the long knives" moment they don't actually kill the "losing" Tories...So we now have Brexit and all the pain that comes with it. Theresa May now saying it's my brexit or no brexit. It’ll be interesting to see whether Corbyn will be able to stick to his position of not having a second referendum. Definite momentum in the party towards having one. There is no parliamentary majority for any form of Brexit so it seems to be the only viable way out. Certainly if would be political madness if May called an election that Labour wer to win, for Corbyn to allow his government to be torn apart in the same way as is happening with the Conservatives. Oui, je regrette un peu . 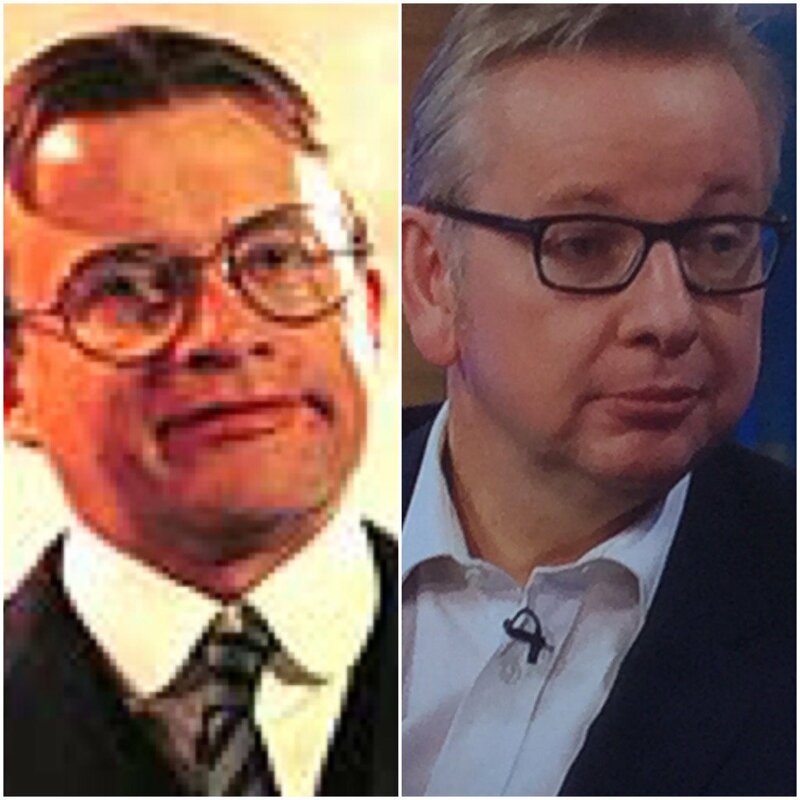 . .
Tracey Ullmann’s depiction of Gove is sheer genius. The Maybot has now caved in to the member for the C18 Rees-Mogg. No deal is coming home due to the EU refusing to negotiate a fair deal in fear of other countries leaving . It will cost them £40 billion so expect a last ditch change of heart and negotiation from them . Get used to Democracy and the will of the people and stop throwing your toys out of your pram just because you lost the vote. Ooops -- Lock e'em up, LOCK 'EM UP!!! The investigation found "significant evidence of joint working" between the group and another organisation - BeLeave - leading to it exceeding its spending limit by almost £500,000. Bob Posner, from the Electoral Commission, said: "The Electoral Commission has followed the evidence and conducted a thorough investigation into spending and campaigning carried out by Vote Leave and BeLeave. "We found substantial evidence that the two groups worked to a common plan, did not declare their joint working and did not adhere to the legal spending limits. These are serious breaches of the laws put in place by Parliament to ensure fairness and transparency at elections and referendums." So WTO rules and a hard border between NI and Eire is something to love.